King George VI was not supposed to become the king of England. The second son of King George V endured ill health as a child and a stammer caused him to live in the shadow of his older brother Edward. But with the Second World War looming in 1936, King Edward announced his intention to marry the twice-divorced American socialite Wallis Simpson. After less than a year as the ruling monarch, Edward abdicated the throne to his younger brother. At a time when nations did not need weak leaders, King George, stammer and all, was expected to lead the United Kingdom through war time. Tom Hooper’s The King’s Speech is this story of how a man born into certain expectations rose above his apparent limitations (that st-st-stammer) to become the voice of his people. Colin Firth portrays King George VI; Helena Bonham Carter is his wife, Queen Elizabeth. After a public speaking disaster at the Empire Exhibition in 1925, where the film begins, the then Duke and Duchess of York seek the help of an unorthodox Australian speech therapist, Lionel Logue (Geoffrey Rush). At first the men clash. Duke Albert is ashamed of his stammer. Even as an adult, when Edward (Guy Pearce) calls him “B-B-Bertie,” Albert recoils. And Logue is a stubborn instructor, insisting that if his methods will work then he will be called “Lionel” and the Duke will be called “Bertie”. With the coronation looming, they work out their differences, with Logue getting at the root of Albert’s stammer and they move towards perfecting the king’s speech. The scenes between Firth and Rush are a fine acting duet; they carry the film. 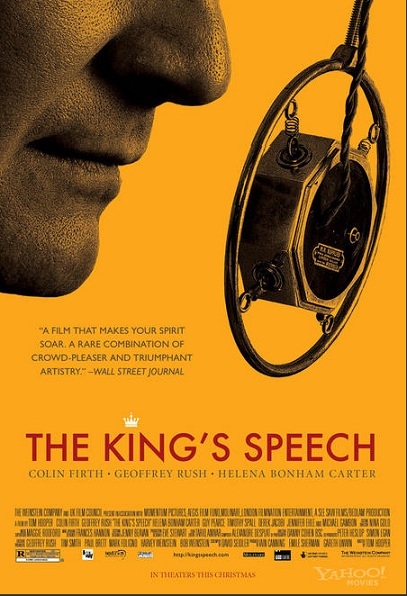 But what works best about The King’s Speech is that it does not preach about the historical moment it visualizes. Instead it depends on the strengths of its performers – Firth and Rush especially – to tell an exceptionally entertaining story. Previous Previous post: Producers Guild Nominations: Is Winter’s Bone out?